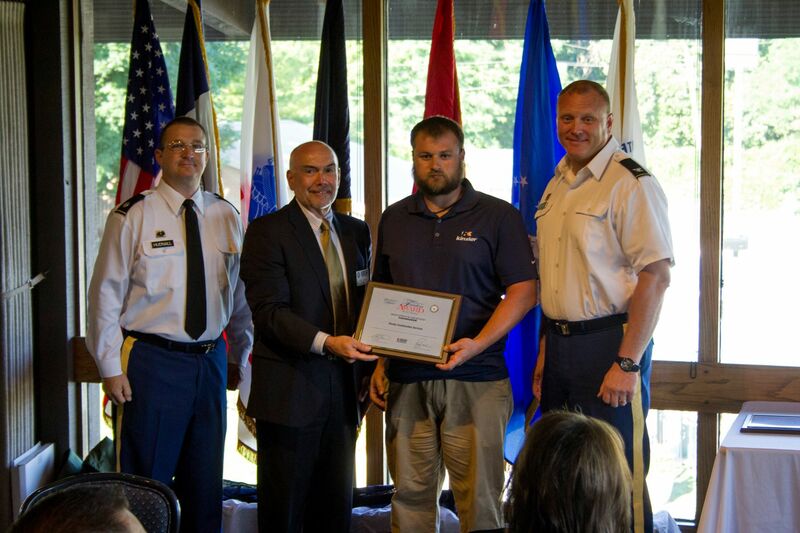 Kinzler’s Distribution Operations Manager AJ Flander, former Army Reserves Sergeant, accepts the award. Kinzler Construction Services was recently recognized for exemplary support of National Guard and Reserve member employees at a ceremony in Des Moines, IA. The United States Department of Defense ESGR (Employer Support of the Guard & Reserve) publicly honored Kinzler as a 2016 Employer Support Freedom Award Nominee. Accepting the award was Kinzler Construction Services Distribution Operations Manager AJ Flander, who served as a Sergeant in the Army Reserves. The Freedom Award is the highest recognition given by the U.S. Government to employers for their outstanding support of employees serving in the Guard and Reserve. Each year, Guard and Reserve employees, or a family member acting on their behalf, have the opportunity to nominate their employer for the Employer Support Freedom Award. Iowa National Guard CPT Craig Coder nominated Kinzler Construction Services. Coder is the General Manager of Kinzler’s Waterloo and Cedar Rapids, IA branches. Kinzler Construction Services is a leading provider of construction supplies and services to commercial, residential and agricultural builders and homeowners. With locations across Iowa as well as Minnesota and Texas, Kinzler is committed to being experts on the latest insulation techniques and building-science technologies, continuously improving value for their clients. The company is rapidly growing and invites you to search job openings and apply to join the Kinzler team at www.insulation.net/careers.